Underage Drinkers Get Carried Away On New Year's Eve, Too : Shots - Health News A national estimate derived from a sample of emergency rooms around the country finds nearly 2,000 young people wound up in the hospital on New Year's Day in 2009 because of alcohol. Easier access to booze and less parental oversight are factors. Mom and Dad aren't the only ones who overdo it New Year's Eve. 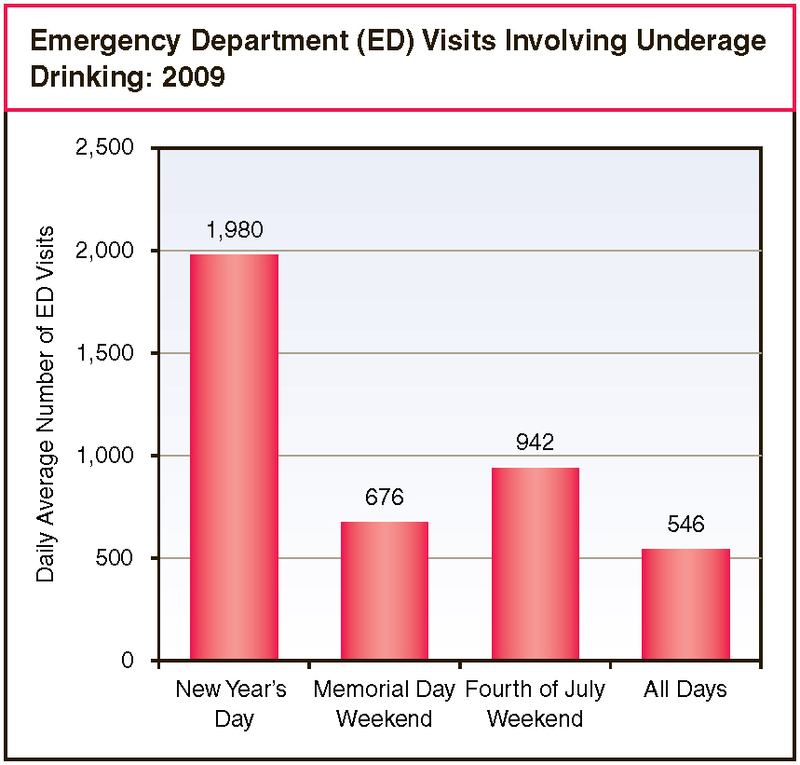 Admissions of underage drinkers to hospital emergency rooms jump on New Year's Day. Drinking binges on New Year's Eve can lead to a hospital-size hangover underage partyers. A national estimate derived from a sample of ERs around the country finds nearly 2,000 young people wound up in the hospital on New Year's Day in 2009 because of alcohol. Those alcohol-related visits were nearly four times the daily average for the entire year, and double those seen daily around the Fourth of July holiday. Anybody who's ever been a teenager probably has a good idea about why New Year's is particularly dangerous. But in case you've forgotten, the folks at the Substance Abuse & Mental Health Services Administration say the important factors are easier access to booze, less parental oversight and mixed messages about alcohol. For tips on discouraging underage drinking, see SAMHSA's website for parents here. And NPR's Allison Aubrey reported on Monday's Morning Edition about how parents' style can make a difference in how much alcohol their teenagers consume. Sociologist Stephen Bahr, a professor Brigham Young University, says, "While parents didn't have much of an effect on whether their teens tried alcohol, they can have a significant impact on the more dangerous type of drinking."